Evaporation ponds were growers’ stopgap measures to continue production when the Kesterson Reservoir no longer accepted tile drainages from irrigated croplands in the west side of San Joaquin Valley. At its peak, there were 3,000 ha of evaporation ponds serving. The pond operation had to comply with federal and state hazardous wastes disposal regulations and prevent selenium build up. As the spent water flowed through evaporation ponds, it underwent continued changes in temperature, pH, dissolved oxygen levels, and dissolved organic carbon contents triggering complex chemical reactions. The evapo-concentrating processes resulted in precipitation of minerals primarily halite, thenardite, mirabilite and other evaporates, and elevated concentration of trace elements in water including arsenic, boron, molybdenum, uranium, and vanadium. The pond supported a thriving aquatic eco community in which selenium bioaccumulated through the food chain. Invertebrate brine shrimps occupy a critical middle link and aid in trophic transfer of selenium. 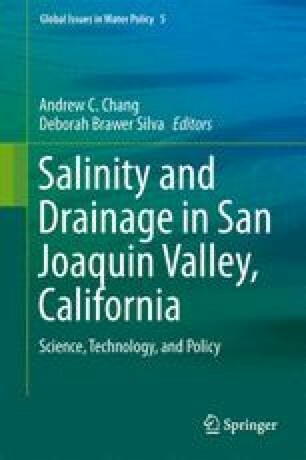 The flow of selenium along the aquatic food chain might be interrupted by harvesting brine shrimps preventing the mass of accumulated selenium from reach the higher trophic organisms.